A recent article in The New Republic was entitled "Hoover's Tragedy." Some of us thought at the time that the tragedy was rather that of the people who had believed Mr. Hoover's campaign speeches of 1928; but he was probably one of those people, and there is no doubt that his personal career has a tragedy, objectively if not subjectively, in the Grand Athenian manner—almost a perfect exemplification of the doctrines of Aeschylus and Sophocles. This generation has little faith in the patterns by which its forefathers tried to interpret human experience; but the ancients were not always wrong. An age which has been totally unable to evolve any pattern of its own might reflect that none of the old patterns of the past came into being by accident or sheer caprice. They all seemed, at the time, the most plausible explanation of certain observed phenomena; even if it turned out later that they did not explain everything, they seemed to explain some things. And the pattern of Greek tragedy, the Hubris-Nemesis scheme that was borrowed from the tragedians by the greatest of Greek historians, fits admirably the case of Herbert Hoover. The crime that brought retribution on the heroes of Attic tragedy was hubris—pride, presumption, overweening insolence. A man who rode high and hard in the conviction that nothing could stop him was overthrown eventually by Nemesis, which essentially was the principle of proportion in the universe. “Pride that has blossomed bears the fruit of ruin,” says the ghost of Darius in “The Persians.” Originally, the idea seems to have been merely a superstitious feeling that the gods were jealous of any mortal who rose too high, and cast him down for the same reason that made Yahweh confound the tongues at the Tower of Babel. But the powerful intellect of Aeschylus could not long be satisfied with this theory. In “The Persians” he seems to accept it; but a few years later the Chorus in “Agamemnon” observes, “There is an old saying among men that great prosperity engenders insatiable woe. But I have my opinion, that evil brings forth offspring of its own kind.” And you can search all of Aeschylus and Sophocles without finding a better example of the hubris that brings forth offspring in its own kind than Mr. Hoover’s behavior in 1928. Our manners, in some respects, are better than those of the Greeks; the outward manifestation of Mr. Hoover’s hubris was not the wanton violence of the ancient tragic heroes, but a smug arrogance. One or two matters, trivial in themselves, that happened to come under my personal observation early in 1928 were the mark of a man who had the bit in his teeth, who had come to believe his own publicity and thought that any interference with him, intentional or not, was the sin against the Holy Ghost. And no one could miss the inference from his studied refusal, during the campaign, not only to mention the name of his opponent, but even to acknowledge that any individual was running against him at all. He was the only candidate; against him were arrayed malign but disembodied forces that somehow plotted evil against American prosperity and the American home. Nor will you find in Greek tragedy any better instance of overweening presumption than in his campaign speeches. He did not have to promise the abolition of poverty to get elected; with Republican prosperity behind him and an Irish Catholic running against him, his election—or that of any other Republican who might have been nominated—was a certainty. He could have said nothing in the whole campaign and still have been elected. Yet he chose to promise the abolition of poverty. Did he believe it? If you accept his Detroit speech of 1932, with its ascription of the economic disaster to the inevitable consequences of the War, he could not have believed it; he was deliberately deceiving us. It is hard to credit that, even though he deliberately deceived his Madison Square Garden audience in 1932 by professing to repeat his 1928 pledge of the abolition of poverty, and omitting the essential and damning phrases that promised it "soon" if only Republican policies were continued. More plausibly, he deceived himself; his immense personal success had made him an easy victim to his own publicity. At any rate, his campaign promises ran to that excess which above all things offended the Greek temperament, which seemed above all things to invite the correcting interposition of Nemesis. Recall that acceptance speech. "Our problems of the future are problems of construction, of progress. . . . The poorhouse is vanishing. . . . There is no guarantee against poverty equal to a job for every man. . . . Our farm-relief program adapts itself to the variable problems of agriculture, not only to those of today, but to those which will arise in the future. . . . With impressive proof on all sides of magnificent progress, no one can rightly deny the fundamental correctness of our economic system.. . . Our whole business system would break down in a day if there was not a high sense of moral responsibility in the business world." Never in American history did a candidate so recklessly walk out on a limb and challenge Nemesis to saw it off. Well, Nemesis sawed it off. Four years alter Mr. Hoover had to explain to the country why it should reelect him, and continue what he had called in 1928 “the policies which have made and will make for the prosperity of our country.” If he had been a little more moderate in his first campaign, if he had made the ordinary speeches of the ordinary candidate, his explanation of the collapse as due to inexorable economic forces might have been more plausible. But in 1928 he had told us that “as never before does the keeping of our economic machine in tune depend on wise policies in the administrative side of government.” Subsequent events had cast some doubt on the wisdom of those policies, as well as on the high morality and distinguished ability which Mr. Hoover had noted in American business leaders. Mr. Hoover had a great deal to explain away; and here, it must be confessed, he fell considerably short of tragic grandeur. Compare him, for example, with Oedipus. 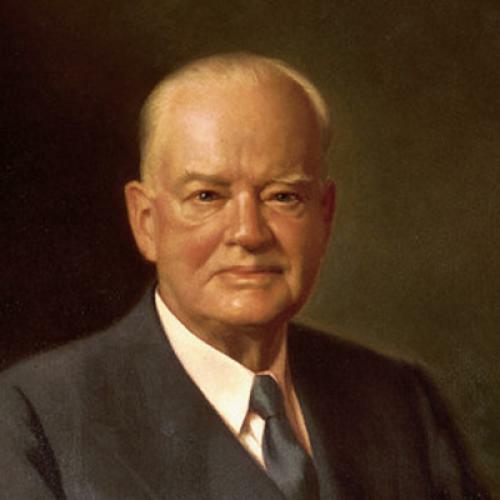 Oedipus, like Hoover, thought very well of himself, and was highly regarded by his constituents. We first see him when his country is suffering from a severe and unexpected depression, and his fellow citizens think that he can straighten matters up if anybody can. To their appeal Oedipus responds, in substance, that it would be a malignant slander to suppose that he has sat in the White House all this time without suffering as his people suffer; he has wept for their sorrows and put on the hair shirt. Immediately after which he announces that he has already taken steps to alleviate the depression; he has appointed Kreon as a fact-finding commission. Kreon’s subsequent experiences—and those of the expert, Teiresias, who was later enlisted in the business of fact-finding—are reminiscent of Mr. Wickersham’s. When their conclusions are reported to the Theban White House they are immediately thrown into the wastebasket; and Oedipus accuses the expert whom he himself had called in of trying to smear him in the interest of his political enemies. “I would not have sent for you,” he says in substance, “if I had known you were going to talk nonsense.” And Teiresias puts into words what the economists who advised Mr. Hoover about the tariff, and the jurists who made the suppressed report on the Mooney case, must often have thought: “Knowledge is a terrible thing when the man who knows cannot get any results.” And what made this man, so disinterestedly solicitous for the welfare of his constituents, fly off the handle? Why, it was being intimated that the Executive was responsible for the depression, and that things would go better if there were a change of administration. So far the parallel is fairly close, but in a latter part of the play it must be admitted that Oedipus behaves better than his modern analogue. He does not misquote his past promises; he does not say that it might have been worse; he does not tell his constituents that grass will grow in the streets of Thebes if they turn him out; he merely goes. But then Oedipus was not a very flagrant example of hubris; in his case the depression that had befallen his people was really the consequence of inexorable forces whose operation had begun in the distant past. He had not affronted the principle of proportion in the universe by making promises that no man can fulfill; he had not, like Ajax and Hoover, dared the gods to strike him down. But this, you may say, is merely a pattern of fiction. It was not fiction to the men who wrote it, or who saw the plays performed; they thought these plays dealt with actual figures of past history—as in many cases they did. So it was with no sense of artificiality that Herodotus and Thucydides could apply the dominant thought pattern of their time to recent history, and ascribe the outcome of the Persian and Peloponnesian Wars to Nemesis operating against the overweening insolence first of the Persians and then of the Athenians. To the scientific historian of today that theory is nonsense. What beat the Persians? Difficulties of transport and supply (already noted by Aeschylus who had himself fought against them) probably played their part; but the fact remains that Xerxes came up to the decisive battle with a bigger fleet than the Greeks could bring against him, and he was beaten chiefly because there was a man named Themistocles—a leader more daring and resourceful than the Greeks ever had before or afterward. There is some excuse for a historian who sees the hand of the gods in that. As for the Athenians in the Peloponnesian War, they could have defended their city and their food supply and the essential parts of their empire indefinitely, if they had not thrown away their fleet in the Sicilian adventure. The state of mind that convinced itself that all the troubles of the nation could be cured by this plunge into the remote and obscure has its points of resemblance to the bull-market psychology; there never was a brighter Cloudcuckooland than the one that was built in Wall Street in 1928 and 1929. At any rate, the Athenians—after their classic demonstration of hubris over the Melians—invited their own disaster by attempting the impossible. The Hubris-Nemesis pattern may have its flaws, but at least it does express this much truth—that there are some things that cannot be done, and that only a fool would attempt them, or promise them, unnecessarily. Tragic heroes ought to be drawn larger than life—at least so thought the Athenians, who had not the advantage of our enlightenment and were accordingly unaware that only degenerates and half-wits are the proper material for art. When Euripides depicted the average man in Admetos, his fellow citizens thought he had lowered the dignity of the tragic stage. If Mr. Hoover in his hair-shirt moods resembles Admetos more than the other heroes of classic tragedy, that is the difference between realism and the grand manner. Precisely how he will take his downfall remains to be seen; during the campaign he had to assume that the electorate would never be so foolish as to fail to reward his services with another term, so that some of his speeches approached the hardihood of Prometheus chained to his rock, and still shouting his defiances at Zeus. No doubt, to his admirers, the President has his Promethean aspects; for Prometheus, after all, was the first Engineer of Human Happiness. By his gift of fire he stepped up industrial production and he enabled men to escape the prevision of their fate by putting hope in their hearts. But that hope was "blind"—i. e., obscure, deceptive; Prometheus knew it was little if any more than an anodyne. There was nothing blind about the hope of the abolition of poverty which Mr. Hoover put in his hearers’ hearts; it was a clear promise, conditioned only on the continued operation of the "individualist" system under the business leaders whose ethics and intelligence Mr. Hoover admired so highly. And accordingly, by an irony finer than any tragic poet ever conceived, Mr. Hoover, who in 1928 was denouncing his unnamed "opponents"—on extremely scanty evidence—for plotting to introduce state socialism, was compelled to ask for reelection in 1932 as a reward for his own success in introducing state socialism. (Let us hope that the Reconstruction Finance Corporation will prove a brighter star in his crown than the Federal Farm Board.) The man who promised the abolition of poverty had to ask for another term of office on the ground that it might have been worse. In Mr. Hoover's record of the year preceding election there was a good deal of sound campaign material, especially by contrast with the record of the Democrats in Congress. As an ordinary President who had done, even if belatedly, the best he could, he might have asked for reelection with better grace and better prospects. But he was not an ordinary President; he was the man who had promised what no President had ever promised before—the abolition of poverty. He had promised it needlessly, superfluously; and any man who questioned his ability to abolish poverty was an enemy of the Light. It is a long time since we have seen, and one may hope that it will be a long time before we see again, such an instance of the overweening presumption that invokes its Nemesis.